Patrick Lee, American painter, b. 1972. Patrick Lee takes a unique creative approach to making paintings in the studio and en plein air. He draws heavily on intuition and imagination to develop an image, often altering the drawing, color, and spatial relationships to create a mood and express a feeling about the subject. This often leads to strong elements of abstraction and suggestion in his work, rather than explicit detail. This gives the viewer an opportunity to connect with each piece in their own way, inviting them to let their own imaginations make personal associations and connections. Patrick Lee Patrick Lee, American painter, b. 1972. 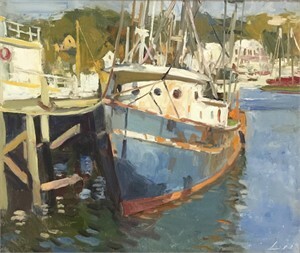 Patrick Lee takes a unique creative approach to making paintings in the studio and en plein air. He draws heavily on intuition and imagination to develop an image, often altering the drawing, color, and spatial relationships to create a mood and express a feeling about the subject. This often leads to strong elements of abstraction and suggestion in his work, rather than explicit detail. This gives the viewer an opportunity to connect with each piece in their own way, inviting them to let their own imaginations make personal associations and connections.